We lived for six years south of Tucson, Arizona, the eastern part of the Sonoran Desert. The climate was certainly different from Wisconsin where my wife and I grew up. There we could go weeks without rain, without even a cloud in the sky. The annual rainfall in our area was 12 inches but most of that fell during the monsoons, in late July and August. The 110º days of summer baked the soil so hard it had a special name- Caliche. When we needed a new gas line run through our yard, it took two men, a gas-powered ditch digger, and several hours to make the two feet deep grave for the pipe. A Mattocks would hardly dent that soil! So you can imagine how surprised I was when, the first summer in our home, I found a six-inch toad enjoying a refreshing dip in our swimming pool! I rescued that one but others drown or got caught in the filter system. Where would a frog that size survive in such a dry climate, I wondered? I later learned that this area was the home of Couch’s spadefoot toad. In spite of the hard soil, the toad digs into the soil with its hard, sickle-shaped tubercles (or spades) located on the undersides of their back feet. They dig their burrows by backing into them as they dig with their back feet. There they will remain for 10 or 11 months of the year, hibernating not from cold but from heat and drought. When the rain comes, the male toad will emerge from the hole and find a female by means of a call resembling the sound of a baby lamb. The female will lay her eggs in puddles and soon the whole family of toads will dig into the soil once again to lie dormant for most of the year. The spadefoot; the moisture detector on the skin; the reproductive system ready as soon as moisture comes; and the knowledge to protect itself from the sun, to dig, to emerge when moisture comes, and to mate are all abilities that were required from the beginning. They could not have evolved over millions of years for if all parts of this survival technique were not in place at once, we wouldn’t know of this frog today. Neither were these skills needed when the first severe summer arrived following Noah’s flood. 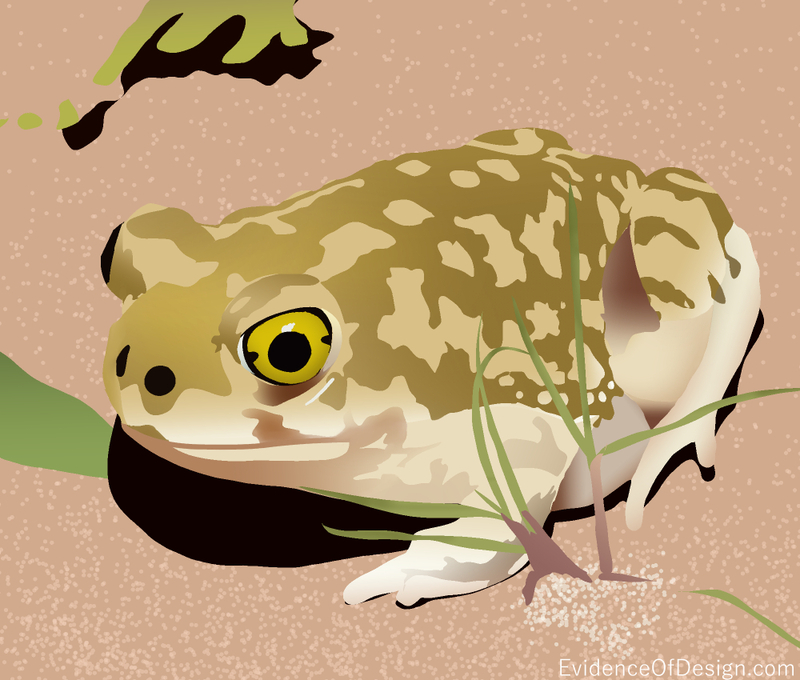 We can only explain the unique ability of the spadefoot toad to survive in a desert to a wise Designer who gave the toad this skill before it would need it. Now doesn’t that sound just like something God would do? Thanks for the info…..I was digging some dirt out around our pool cover pump that a certain rodent (a ground squirrel) had decided to hole up and to my surprise I dug up a toad! He was a little shock but I recovered and the kids and I put him in a bowl with some dirt to watch him, it was amazing to see him bury himself to where you couldn’t even see him. The next day we put him back, thinking he had been doing a fine job of eating the spiders. I slowly walked over to where I had dug him up and proceeded to bury himself again. It took a while to identify him, my sister found your site and sent it too me, and yes I agree God has created some amazing creatures for us to enjoy!